Time lapse video requires a moving subject to be effective—clouds, ocean waves, people, traffic, all make fascinating time lapse scenes. Another requirement is camera stabilization. A tripod or other reliable camera support is essential. Hand held time lapse would be far too jerky. Another option is camera movement. Panning creates a much more compelling time lapse video, which is the subject of this blog. 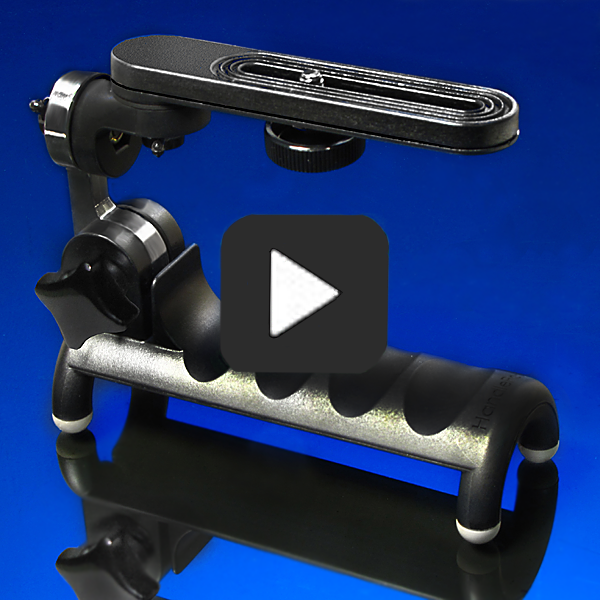 Muvi X-Lapse camera rotator is inexpensive and does an excellent job. There are many time lapse camera rotation devices available in a range of prices. The unit described here is the Veho Muvi X-Lapse available from Amazon for $17.59. It is inexpensive and works extremely well with some limitations. One is weight. It will support a smartphone, action camera, a point-and-shoot or small mirrorless. Maximum camera weight is 750 grams or about 26 ounces. A DSLR would be too heavy. It comes with a smartphone holder that is useful but does not solidly grip the phone and is subject to wobble. A strong wind could shift it. A more reliable tripod adapter for smartphones is recommended. AKORAK mini ball head is useful to point the camera up or down while the rotator remains level. Another useful accessory would be a mini tripod ball head. A small one such as that pictured can be had for as little as $5.99 on Amazon. The reason for adding a ball head is because the rotator must be level or it will tilt the camera up or down as it turns. If you want to point the camera in a direction other than horizontal, it must be done with a mini tripod head while the rotator remains level. There are not a lot of options with a device this simple and cheap. Speed of rotation is fixed at one hour for a 360 degree rotation. It can be set for any degree of rotation and there are markings for 15, 30, 45 and 60 minutes. Also it will only turn from right to left. Left to right rotation is unavailable with one exception described later. Three fold out feet make the X-Lapse more stable on a flat, solid surface. But what if a level surface is unavailable and you don’t have a tripod? That’s where HandlePod is a useful alternative support. It will attach firmly to any object that the elastic cord will wrap around. Another approach is to attach it with sticky putty as described in a previous blog. This will easily hold a smartphone or small action cam. HandlePod can be attached to horizontal or vertical supports like railings or poles. Muvi X-Lapse mounted on HandlePod and attached to a gate post. On vertical objects like the gate post pictured here, the slotted camera mount leaves plenty of room to hold the rotator and the smartphone. It allows full rotation without interfering with movement of the smartphone as it turns. Muvi X-Lapse mounted on HandlePod upside down will reverse rotation from left to right. As mentioned earlier, the X-Lapse only turns from right to left. This can be reversed on a vertical support by mounting the X-Lapse on the HandlePod upside down as pictured. Now it will turn in the opposite direction from left to right. There are many time lapse apps for smartphones that work extremely well. An earlier blog talked about Framelapse Pro. Another app for Android is Hyperlapse. These work extremely well and are easy to use. A rotation device such as X-Lapse mounted on Handlepod allows compelling time lapse video panning with a minimum of equipment weight, bulk and expense. This entry was posted in Tripod Alternative on April 16, 2017 by main user.